The first DLC Story Operation, a new Competitive Multiplayer Mode, special Spooky Skins, and lots of other changes arrive today in Battleborn! All five of the upcoming Story Operations are included in the Season Pass and Digital Deluxe editions of Battleborn. If you’re not already on-board for the DLC, each Story Op can be purchased individually for 700 Platinum in the in-game Marketplace. Check out this post for an in-depth look into the first Story Operation. The brand new FREE Competitive Multiplayer Mode, Face-Off, also arrives today in Battleborn! Fight against the enemy team AND the Varelsi in this intense, multi-phase mode. Hack, slash, blast, and crush your way through Varelsi and pick up the masks they drop. Deposit the masks for points. The first team to 500 wins. Of course killing Varelsi makes them mad. Prepare for the Varelsi to get tougher and boss battles as they attempt to throw a wrench in your plans. Face-Off is FREE for everyone who owns Battleborn. Learn more about this new Competitive Multiplayer Mode in this post. PATCH NOTES: There have been a number of changes, adjustments, and additions to Battleborn, including removing collision between allied players, character balancing, bug fixes, and adjustments to Story missions just to name a few. Check out the full patch notes here. Have a scarily fun time with these new Battleborn Spooky Skins! Available later today in the Battleborn in-game Marketplace, these skins for Alani, Deande, Pendles, and Reyna will be the highlight of your monster mash. WHAT ELSE IS NEW IN BATTLEBORN? Three FREE new heroes – Alani, Pendles, and Ernest – with two more on the way! That brings the total to 30 playable heroes for everyone who bought Battleborn. 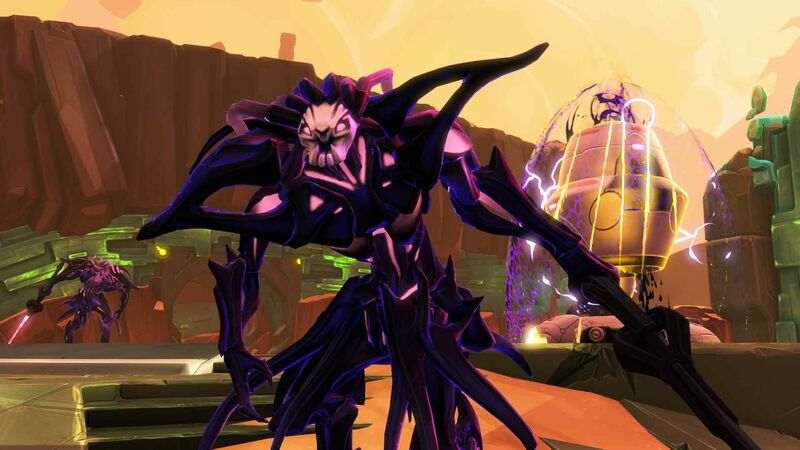 TAKE A DEEP DIVE INTO THE NEW BATTLEBORN CONTENT! If you already own Battleborn, snag the Season Pass to get access to the “Attikus and the Thrall Rebellion” today and the next four Story Operations upon release. New to Battleborn? Dive in with the Battleborn Digital Deluxe edition to get access to “Attikus and the Thrall Rebellion,” the next four Story Operations, hero keys to unlock Battleborn 26 – 30, and of course the base game and all of the FREE content available to everyone who owns Battleborn.